Ahoy! The pirates have come back to deliver more metal to plunder to. The fourth album by these guys is like the ocean. Sometimes it's smooth sailing other times it's a typhoon. The silliness from their last album comes through on this one very clearly with most songs being humorous. Some of them, it works for and some it doesn't. However, as they predicted on album three, there are moments where it seems they're scraping the barrel for creative ideas. As aforementioned, some of the songs are a little bit bland and feel like they're recycling ideas they've already used. Sadly, that makes this album drag on a little bit. That said though, there are some good songs on here that'll stand up to the rest of their catalogue. 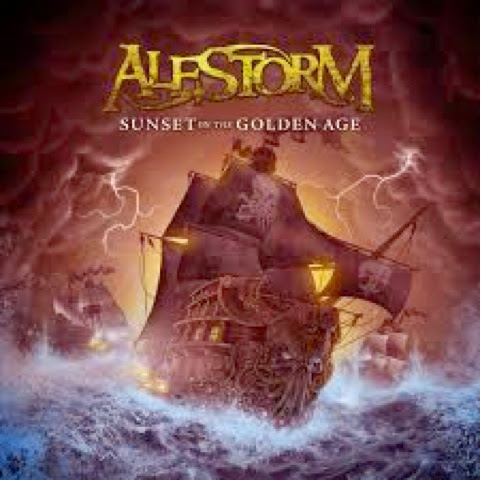 Plus, this is still a fun album which it needs to be for pirate metal. One of the best songs on here is "Hangover". It's a cover of Taio Cruz feat. Flo Rida. Yeah, it's odd to think ain't it?This is the track with the rapping and it works in a weird way. As for the bonus tracks, there's five of their old songs recorded acoustically. They're interestingly done but I feel like they would've been better suited as a stand alone EP. The last bonus track is called "Questing Upon The Poop Deck". It's a moment where the humor really shines and should've been on the album itself instead of the unbearable "Wooden Leg". Although, it surprises the hell out of me that it took em four albums to make a poop deck joke. The sun may have set on their golden age,but it is still fun and if you like the band is definitely worth the listen. Just don't expect any boundaries pushed. "Questing Upon The Poop Deck"